The few weeks surrounding the March Equinox are a great time to gaze into the night sky and search for incoming fireballs. No need to worry. As far as we know, no one has ever been killed by a fireball from space. A fireball is just a particularly bright meteor. It has an apparent magnitude of at least -4, so it is about as bright, or brighter than the planet Venus. The brighter the fireball, the more rare they are. 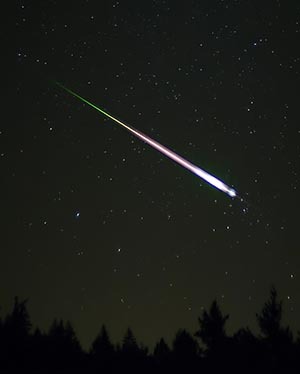 Fireballs that are especially bright and explode in the atmosphere are commonly known as bolides. A bolide that detonates into a burst of visible fragments is a visual treat that you won’t soon forget. More than a thousand fireballs enter our atmosphere every day. Sounds like there’s a great chance to see one.